“Not even in my dreams did I think that music would become my profession. I just kept on learning never thinking of performing,” says Geetha Navale, who performs almost every day on various platforms from watering holes to fests and even as part of path-breaking collaborations. What drives Geetha is her passion to take classical music to the youth, who are now “more interested in guitars and keyboards”. And helping her in this mission is her husband, also a musician. 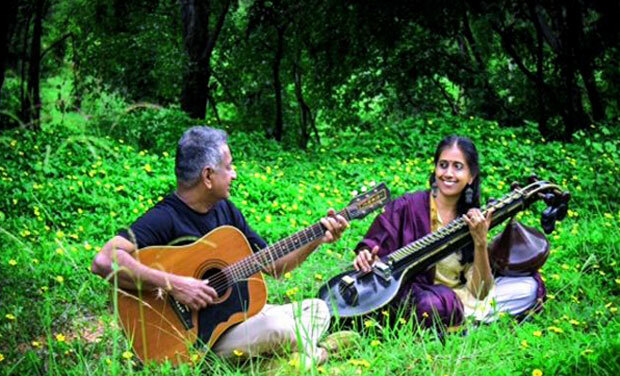 Gopal and Geetha perform together under, The Esperanto Project, which aims at creating a global language for music bridging different traditions. Geetha, a Hyderabadi trained in Veena from the age of nine under J. Anja-neyulu, the then vice principal of the music college in Hyderabad. “My classes would begin exactly at 4.30 am,” she recalls. While Geetha led a “sheltered” life focu-ssed on music, Gopal was having “a tumultuous teenage filled with angst, Camus and Rock- n- Roll in Bengaluru.” Slowly, love blossomed over the common passion for music. Today, the two share the common mission of “glamorising” Indian classical traditions. Running a picturesque music school in Beng-aluru, the couple understand the inclinations of the young. “There is an urgent need to glamourise the wonderful Indian musical ethos to attract young minds,” says Gopal. The two have been continuously working in their own ways of bridging the gap. They have even been instrumental in curating artistes for popular fests like Freedom Jam and Fireflies in Bengaluru, Geetha now wants to give back to her home town and is planning a world music fest, which she visualises at the Golkonda Fort. “If the fest takes off, it would aim at highlighting regional Telugu folk, as well as folk from other regions, classical traditions along with a contemporary touch. We are confident that the urban audiences yearn for an eclectic mix of music like this,” they say.